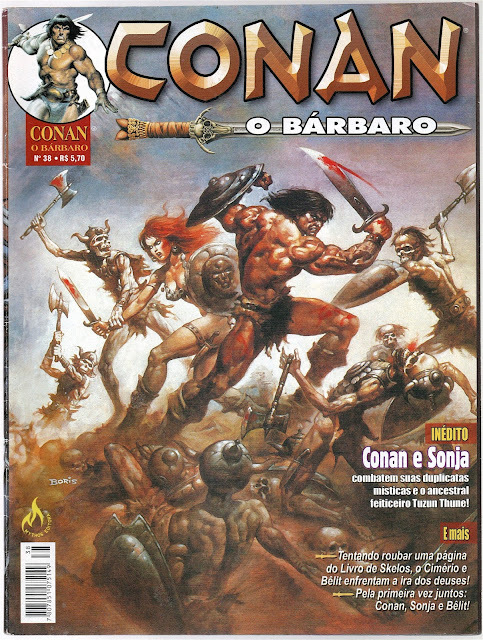 "The Savage Sword of Conan the Barbarian #1 International Set"
As an amateur comics collector/historian focused on international editions, this thread is intended to draw attention to the various international comic editions published in 42 countries that feature Conan the Barbarian. 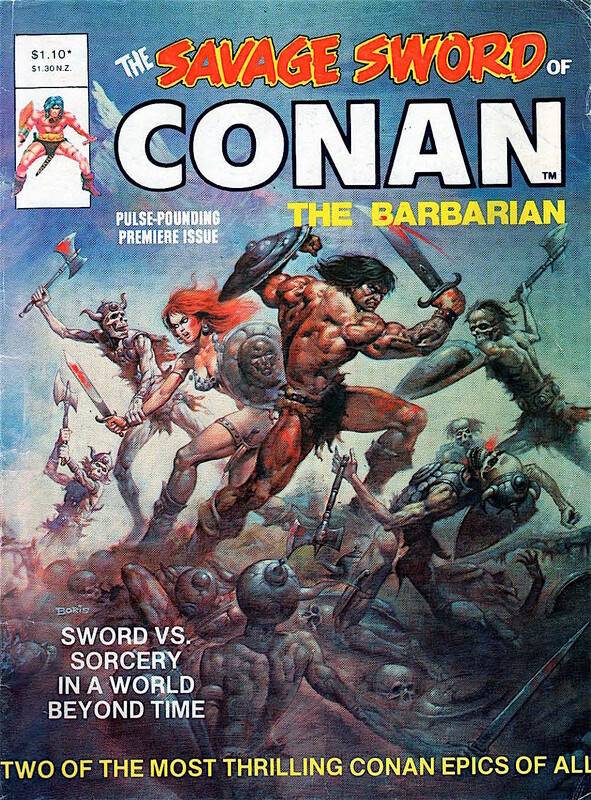 This post will feature The Savage Sword of Conan the Barbarian #1 (first published in English in the USA by Curtis / Marvel Comics in 1974) and serve as a basic introduction to collecting international Conan comics. There are 25 known editions from 14 countries that feature the same cover art (I'm not including international editions that feature the stories from the interior of this issue without the iconic cover art). Among collectors of international comics, this type of redundant cover collecting is known as "Set Collecting" where an individual collects every single edition ever published in the world to make a complete International Set of a given issue. The set is identified by the title and issue number of the 1st edition published, which is typically from the USA in English. Individual issues within the set should always be identified by their indigenous titles/languages/numbers (shown below each cover) as the collector will have greater success searching with that information. Set collecting can take a great deal of effort, time, and money but it is particularly engaging and rewarding. 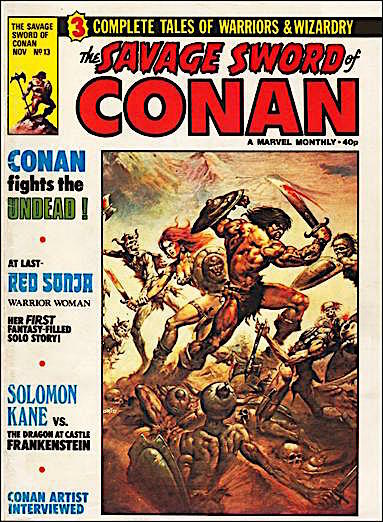 Instead of merely buying the same issues as many other collectors, the set collector works to build a collection that is culturally and historically unique. As far as is known, this is the only complete International Set for this issue in the world. From a collecting point of view, the investment in building a unique collection that differs from probably all others can redefine the hobby of comic collecting. International editions are mostly ignored by less knowledgable dealers and many comic collectors whom typically think of these as reprints. Amongst the comic professionals in grading and price guide compilation, these comics are classified as international editions. To clarify, a reprint is when the same exact edition is republished later within the same country/language with minor differences such as series title, issue number, price, and advertisement content. 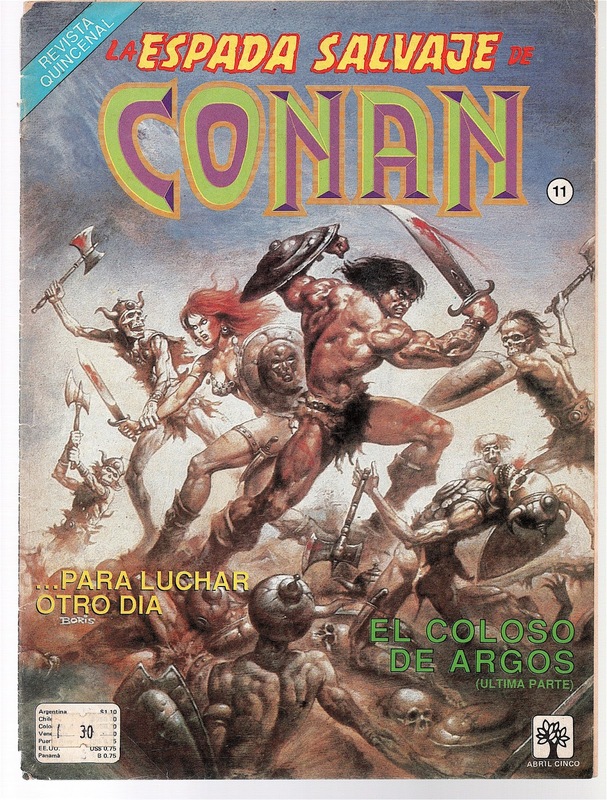 An international edition is not a reprint because the edition is published for the first time in a given country/language often with a greater degree of variance from the US original such as language, series title, coloring, art/textual changes, interior content, physical size, binding, and changes due to translation/censorship. International editions are more similar to variants than reprints but are typically published at much lower print runs than editions in the USA meaning they tend to be more scarce and rare. 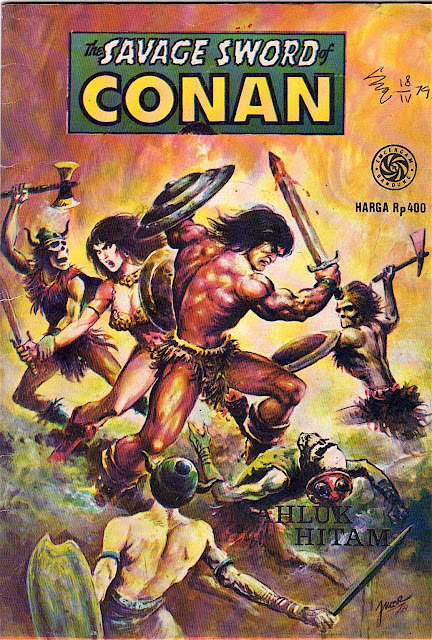 Future posts to this blog will feature other examples of international Conan comics. 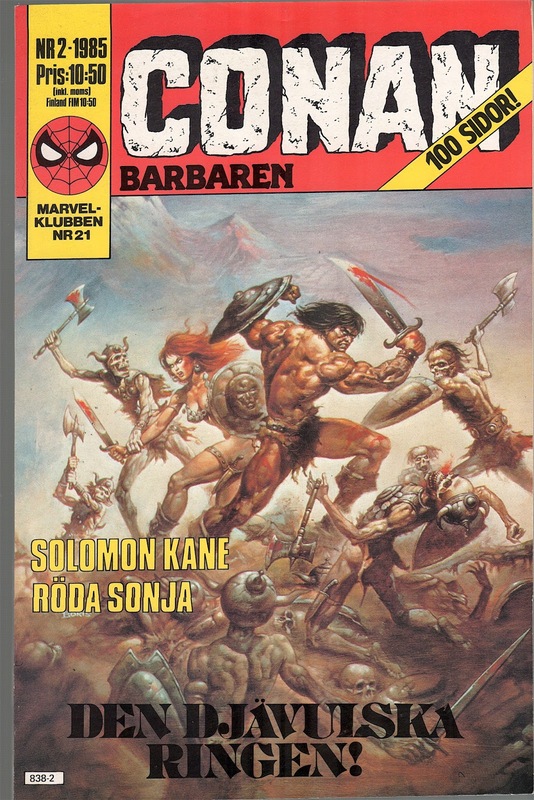 Below is the International Set for The Savage Sword of Conan the Barbarian #1 featuring all 25 international editions in chronological order by year. This is the 1st edition of this issue / cover art (by Boris Vallejo) published in the world. This issue contained both original and reprint material (previously published in color) presented here for the first time in black and white in a larger sized format. 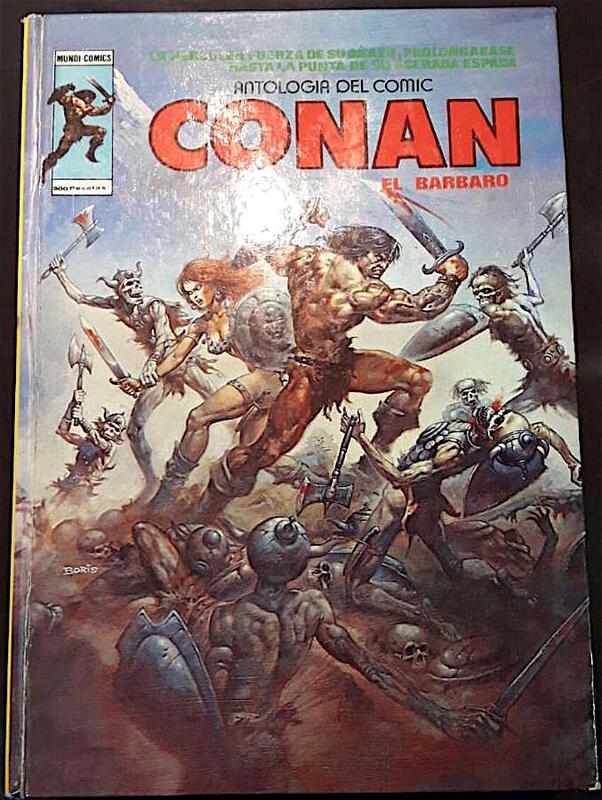 Published in Spain in the same year as the USA edition, the Relatos Salvajes series (translated as "Wild Stories") featured a number of issues with Conan, Kull, kung fu, science fiction, war, and some super-hero stories in Spanish from Marvel. This edition varies from the USA not only in language but in its square binding. 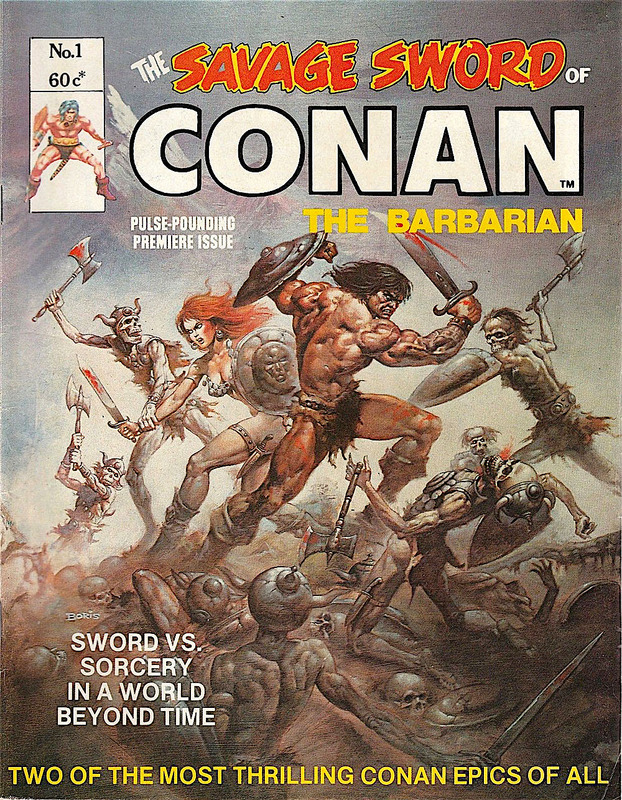 Three editions of this issue were published in Australia by two different publishers. Newton Comics was a short lived publisher in Australia that licensed comics from Marvel. In just over 2 years, Newton Comics published 181 different comic series. 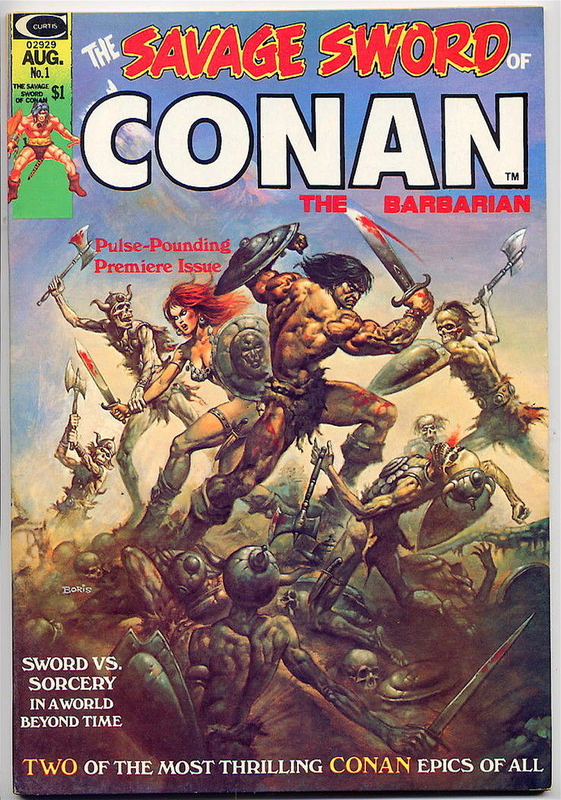 This Australian magazine sized edition has a great degree of color variance on the cover from the US edition and included an interior poster of Conan. This edition varies greatly from the earlier Spanish edition in its lavish hard cover and square binding with 244 pages. This is the first hard cover edition with this art published in the world. The absence of text beyond the top adds to the appeal of this edition as more of the art can be appreciated. 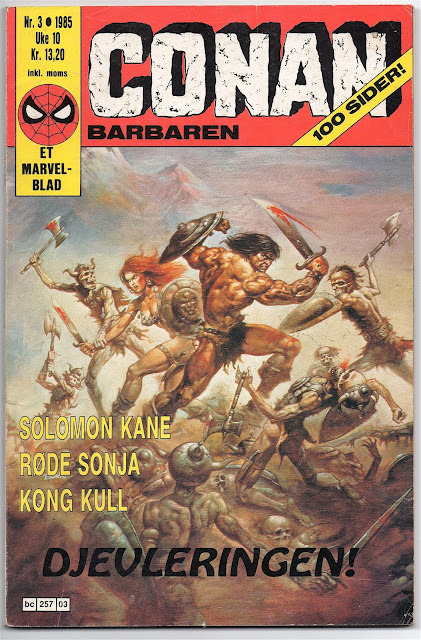 An earlier weekly series published in England from 1975 was titled Savage Sword of Conan but did not use the iconic Vallejo cover art. This second series from England was very similar to the US series in content but sometimes with edited cover art as can be seen in this edition, which still has appeal with the white framed variance. This Australian edition from Yaffa in 1978 more closely resembles the US edition with some minor font, color, and price variance. Indonesia: The Savage Sword of Conan, "Mahluk Hitam"
This Indonesian edition was published without a date but the cover artist dated his work 1978 (but this issue probably appeared in 1979 and most likely unlicensed). It is slightly smaller in size than a US comic. 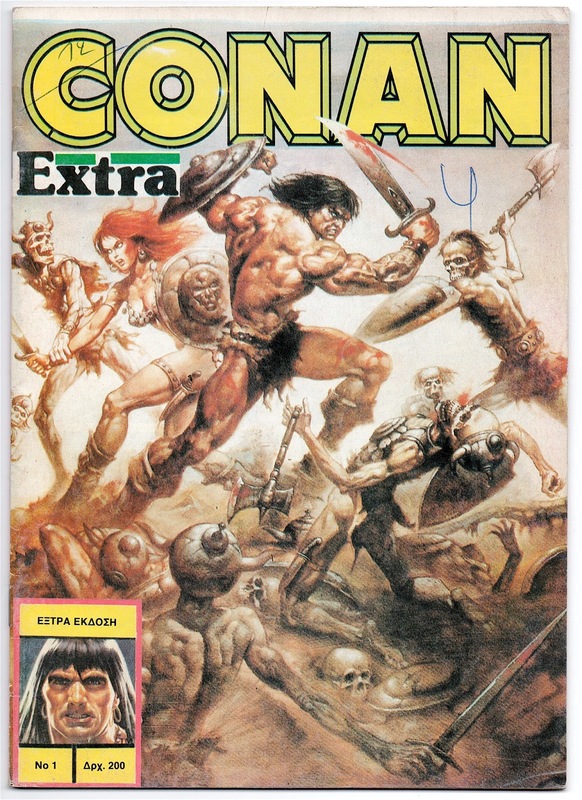 The appeal is in the re-drawn cover art signed by the Indonesian artist in the lower right corner and in its color variance. Indonesian comics are often published without numbers and sometimes without a year so it is typical to identify the series title first (in italics) and then the particular "story title" (in quotes) for the purpose of identification and classification. Redrawn covers and interior art are quite common with international editions. It may have to do with local labor laws requiring publishing houses to limit their use of foreign produced material. Such requirements would make it possible for local artists to still be employed even when publishers were exclusively using licensed material from the USA. 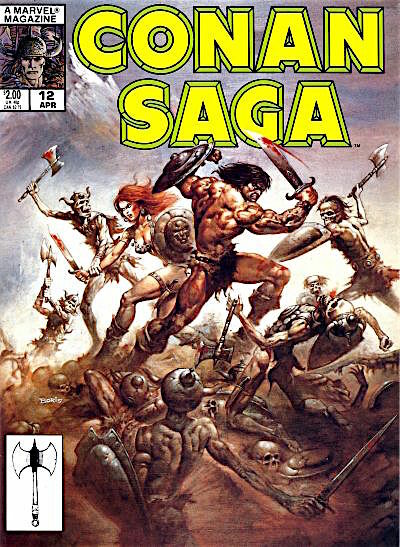 Sometimes artists take liberties with the composition as can be seen in this example where the original Vallejo skull-faced warriors were slightly reinterpreted. Adding to the appeal of many international editions is the less cluttered look of the cover text over the art. US editions typically are text heavy on the cover with pricing, company, bar codes, and explanatory text. Many international editions are free of much of this revealing more of the art for aesthetic appreciation (even when redrawn). The Australian publisher Yaffa (also tied to Page Publications) often republished the same editions towards the end of a series' run but without an issue number. These are typically identified by Australian collectors as "no #." Technically, this issue could be classified as the first reprint of this material in the world. Yaffa issues sometimes were undated but the clue that this is later than the earlier Yaffa #1 is in the higher price variance. The variance in color from the Yaffa #1 adds to the appeal of this particular issue. 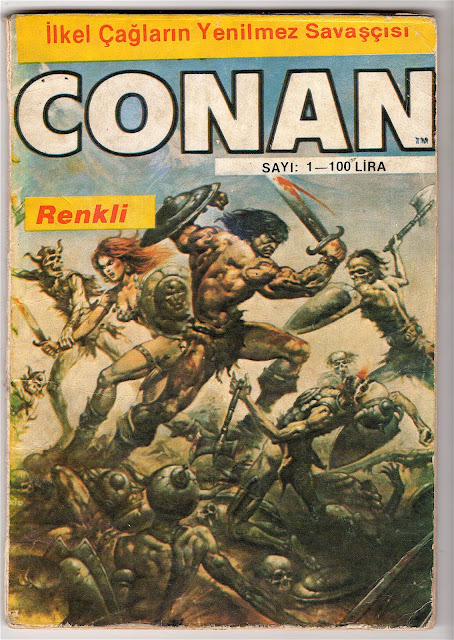 This Turkish edition is the first reduced size variant for this material in the world being in a square bound digest size. In other words, this is the first mini-edition of this material. 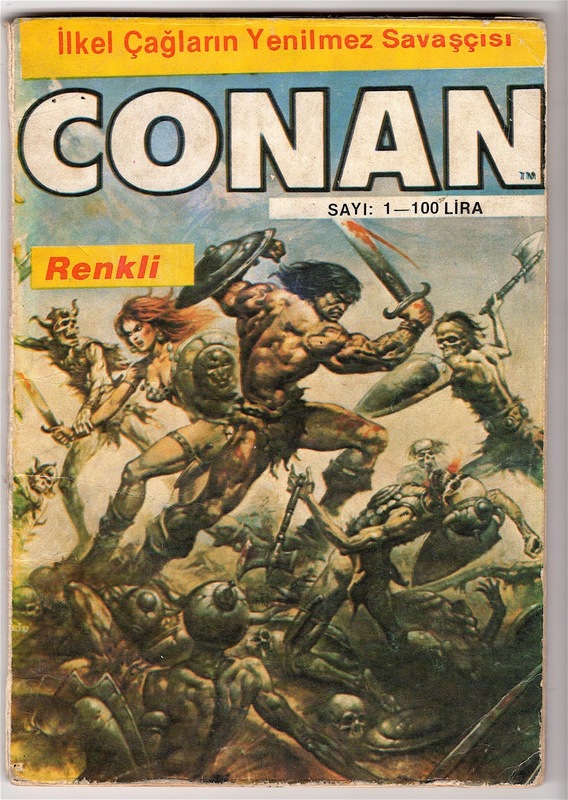 The title Conan İlkel Çağlarin Yenilmez Savaşçisi translates as "Conan the Invincible Warrior of the Primitive Ages. " 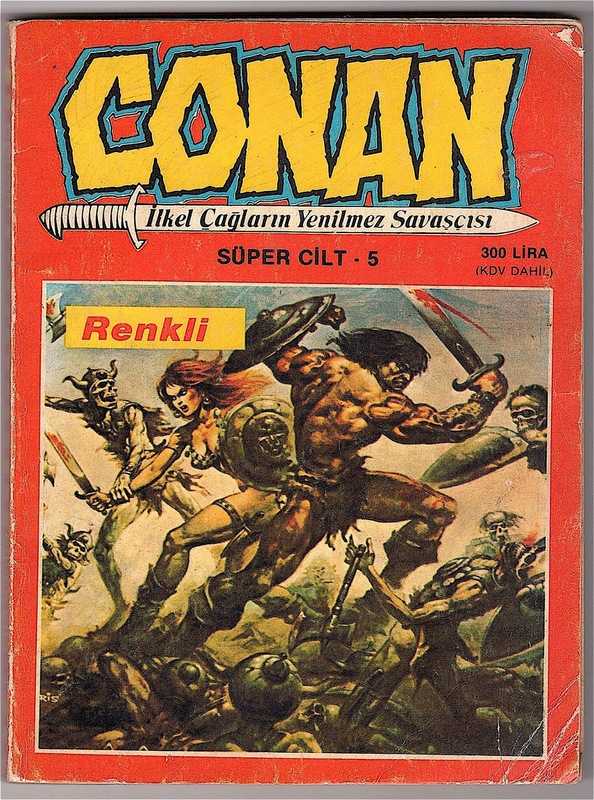 Sayi is the Turkish term for "number" if one is searching for a particular issue but in many countries comics are not numbered purely in a sequential fashion as they were in the USA (as in #1-275). Most will number a particular series sequentially within a given year only (as in 1983 #1-14 and 1984 #1-12). This is compounded by the fact that some countries have published numerous series with the same title (or the same title is used by different publishers)! A collector searching for a particular issue will need to know the publisher, series title, year, and issue number in the indigenous language/script to increase the chances of finding the desired issue. The stories published in many countries did not follow sequentially in order as they were originally published in the USA (and some have even published original material never published in the USA—a later blog post will be dedicated to this topic)! Turkey is one such country where there are at least as many as 30 different Conan comic series. There are 3 editions with this cover art published in Turkey. The Turkish publisher Alfa Yayinlari published both licensed editions from Marvel and unlicensed. This edition is also in a digest size but much thicker in page content as the issue is identified by Süper Cilt meaning "Super Volume." The cover art is obviously greatly edited but the red framing color adds to the appeal of this edition. This magazine sized Thai edition was published without a date but Thai comic dealers always claim this series was published in the 1980s. The title script ช็อค จบใน ฉชบ is transliterated as Chok: Jope nai Chabup, which can be translated in English as "Shock: Complete Story." 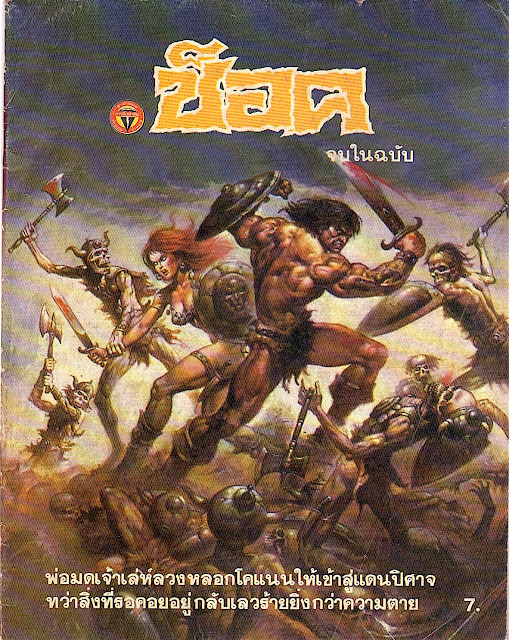 There appear to be two different Chok series published in Thailand by Banluesarn; one numbered and one without numbers (both from the 1980s). The numbered series has over 112 issues while the series without numbers seems to be less than 100 but true output information is currently undocumented. The series with numbers is titled only ช็อค (= Chok or in English as "Shock"). The number in the lower right corner is the price in Thai baht. Numbered issues range from 5-6 baht while the series without numbers ranges from 5-7. This may be a single series where by the time the price increased to 7 baht, issue numbers were dropped. The confusing aspect is that some appear with the same price at the 5 baht range with and without numbers. International publishing of comics was not without flaws, and I have found mis-numbered issues in several countries/series. Until a Thai comic expert can address this for certain, I think of these as 2 different series as it makes for easier classification. The challenge of finding this particular issue is in searching in the Thai script in the equivalent of Thai eBay and Craigslist types of sites without an issue number. 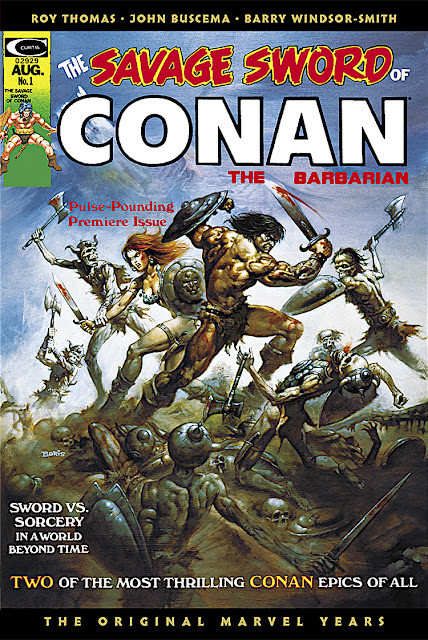 The cover art is the only way to identify the issue unless you translate the text at the bottom, which describes the story as Conan confronting a wizard. This brings up another important aspect of international comic collecting; contacts and management. Any serious international comics collector knows that an invaluable resource is having people on the ground searching for you in the countries you wish to acquire issues from. Without having the language expertise yourself and given that US eBay is not where you can aways find this material, making trustworthy contacts to do international business with is essential. Now the price of your acquisition has just gone up! 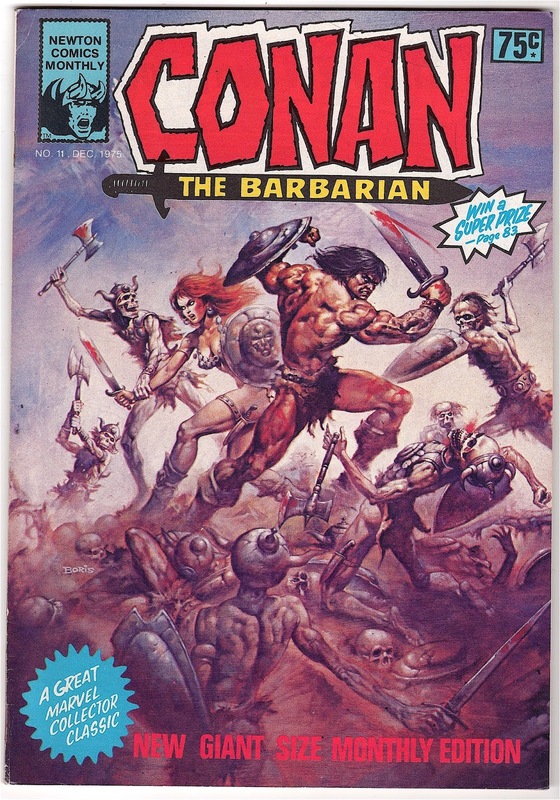 This particular issue came from such a source when I inquired about Conan comics in Thai with an individual I saw selling on US eBay. That dealer knew where to look and found 30 issues for me at $10.00 each plus shipping. There was no option to cherry-pick only desired issues. Luckily for me all were Conan and in decent condition. This issue was a surprise found in that lot deal. To date, I have yet to see another copy. Collectors can find international contacts for comics by writing to dealers on US eBay (or at all of the international eBay sites) as well as various international comics groups in Facebook. Prices for these issues between Thai in Thailand are about $3.00-5.00 US. An American buying from a Thai dealer should expect to pay an increased price typically $10.00-15.00 per issue (some will charge more greatly inflated prices in the $75.00 range to take advantage of you). It helps to have multiple contacts within a single country spread out geographically and not to buy too regularly as the more you do then the lot sizes and costs typically can increase but paying a finder's fee should be a part of every transaction. If you do not keep your contacts satisfied, the issues you seek may be sold to another buyer. 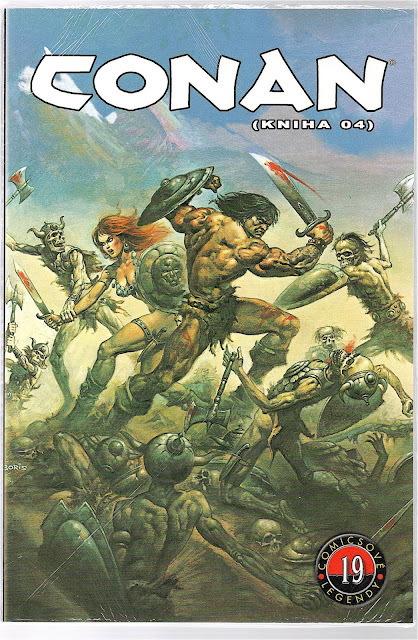 This square bound 100 pages Swedish edition published in 1985 by Semic Press along with their Norwegian and Finnish editions are some of the first to feature large size non-English text emblazoned over the original cover art, which is part of the appeal in collecting these in addition to the listing of 2 additional Robert E. Howard characters on the cover. The issue number also includes a secondary number, here in Swedish as med Marvel-Klubben #21, which indicates the 21st comic published by Semic in Sweden as part of its "with the Marvel Club" campaign. 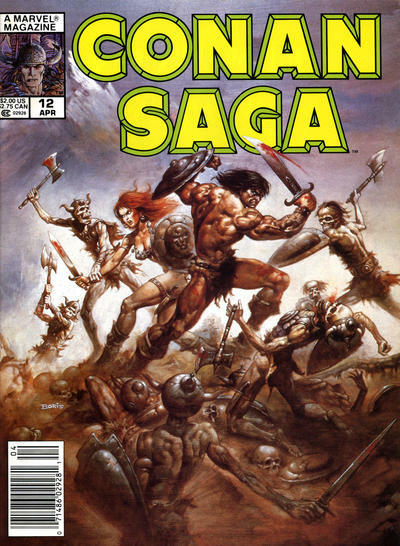 Semic had been publishing comics with Marvel material before this for some time across many parts of Europe. The Marvel Club was possibly a marketing attempt to connect with readers in hopes that they would buy/collect (or consume) each issue in every series they published in a given country. This Norwegian edition from Semic Press in 1985 features the same quality 100 pages square binding with the large Norwegian font across the cover art. As an added appeal, three of Robert E. Howard's more well known characters after Conan are listed on the cover while the Swedish edition lists only 2. For international collectors where expertise in numerous languages is perhaps beyond most capabilities, seeing popular character names in a foreign language can help in future searches for more of this material. The Norwegian et Marvel-Blad is identifying the Marvel brand name as "a Marvel issue." This Finnish suare bound 100 pages edition from Semic Press, also in 1985, features a blue colored font across the bottom; a significant variation from both the Swedish and Norwegian editions. The Finnish phrase Marvel-Lehti also identifies the Marvel brand here as a "Marvel Magazine." The other text 6 Hurjaa Seikkailua can be translated in English as "6 Exciting Adventures." 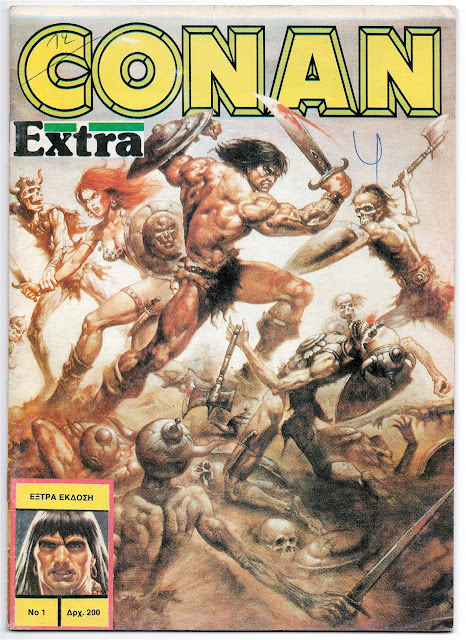 Imagine the young European comic reader's enjoyment at having over 3 times as much story and art each month from their favorite series in comparison the 32 advertisement filled pages of US editions. This bring up another significant difference in the content between international editions and US editions; there are often no advertisements in the interiors of most international comic editions! Comics in Greece tend to have been published in low print runs and often those issues not sold were pulped (recycled/destroyed) making these editions scarce and/or rare to find. Three editions with this cover art have been published in Portuguese in Brazil. This is the first Brazilian Portuguese edition from Editora Abril in 1988 with much darker coloring and far less cluttered look than the US edition because of the absence of text over the art but the background coloring has removed the mountain peak (as many other editions have done). 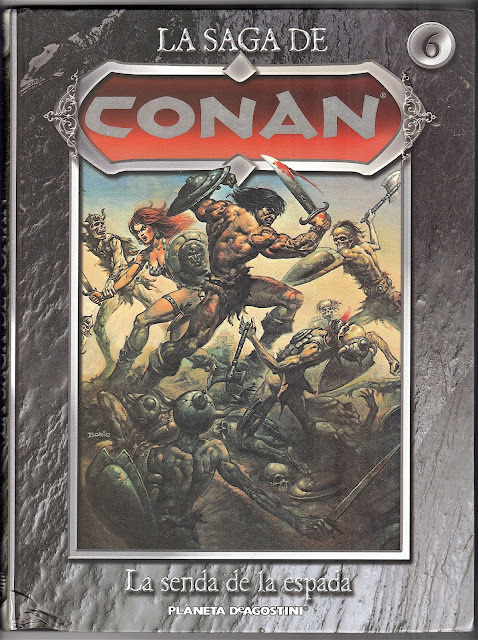 A Espada Selvagem de Conan can be translated in English as "The Wild Sword of Conan." 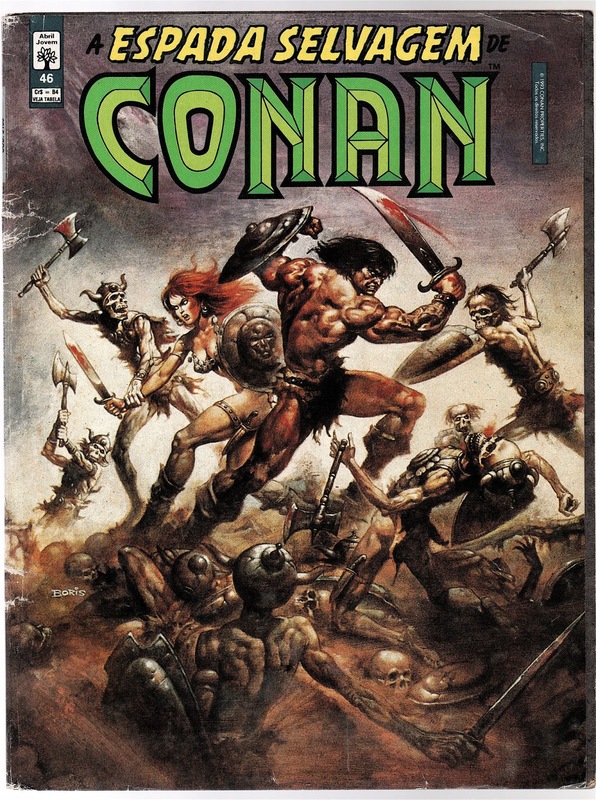 This US reprint by Marvel in 1988 was published in 2 versions with the only difference being in the lower left corner. This is the direct version sold in local comic shops. 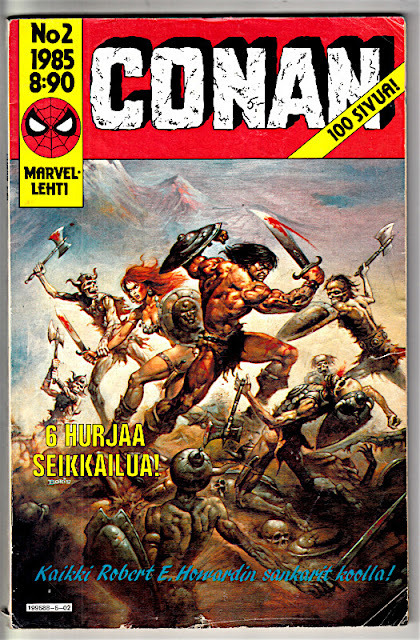 This version of the US Marvel reprint is a newsstand version with the UPC barcode in the lower left corner. Most international editions are devoid of this type of inventory/product identification. Among international comic collectors in the US, Colombia is jokingly referred to as a "black hole" for comic collecting as reliable dealers to purchase from are few and far between. In the lower left corner there is a box identifying where this issue was distributed and its price. This Colombian edition was also distributed in Argentina, Chile, Venezuela, Puerto Rico, Panama, and Estados Unidos (E.E. U.U. = USA) so there are 7 countries to search in for this edition. 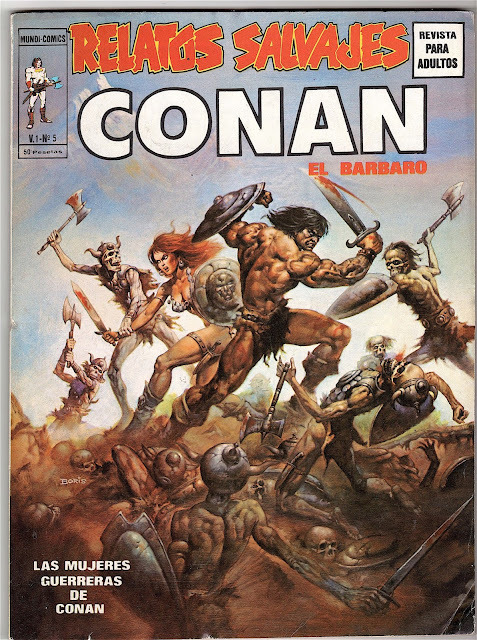 La Espada Salvaje de Conan can be translated as "The Wild Sword of Conan." This is a 2nd edition/reprint in Brazil by Editora Abril in 1993. These are identified in the series as Reedição (= "Reissue"). The minor differences include the year, price, and upper right corner text in blue bar. This is the third version that Alfa Yayinlari published in Turkey. Like the preceding editions, this one is digest sized. 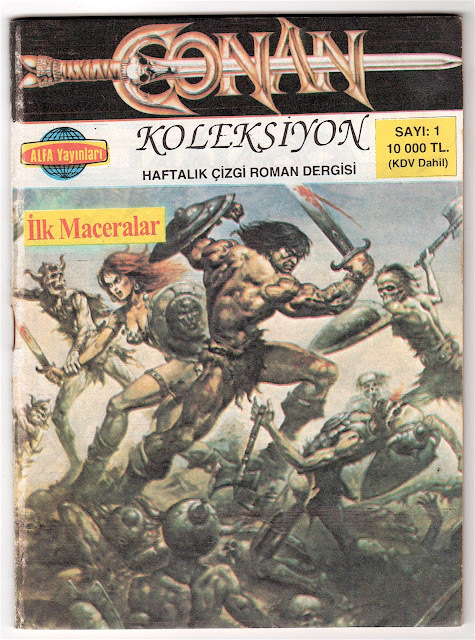 The Turkish phrase Haftalik Çizgi Roman Dergisi means "Weekly Comic Book Magazine" while Conan Koleksiyon Dizisi means "Conan Collection Series." This is the third Brazilian version of this material but this time published by Mythos Editora in 2005. The UPC and amount of Portuguese text make for a very cluttered look on this issue. Spain is one of those areas with over 40 different Conan comic series. This hardcover Spanish edition is from Editorial Planeta DeAgostini published in 2008. This is a recent edition that features the Vallejo iconic cover art. Published in 2010 in Czech by Crew + Netopejr in Czech Republic, it features high quality paper in a thick trade paper back edition sealed in plastic. The high quality paper makes the black and white art most striking. Some European publishers of comics were using high quality bright white acid free paper (as well as square binding) as early as the late 1970s, well before this was common in the USA. Some of the international editions look far different from the original US editions because of this attention to quality. As such, some international editions preserve better. I have Danish editions from 1979 that appear as if they were published today (but certainly this is not the case with the majority of comics from the past in general). The double numbering indicates that this is the 4th Conan book in the 19 books published in this publisher's "Comics Legends" series. 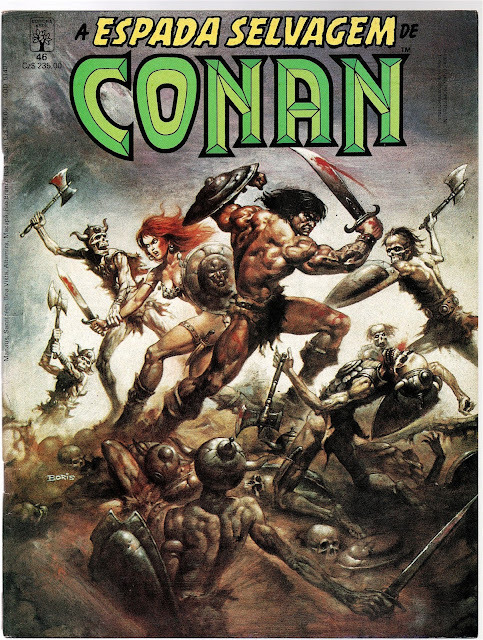 And with this most recent edition in 2019, we come full circle as Marvel Comics picks up the license to Conan once again and floods the American market with a plethora of Conan titles and variant covers. This particular omnibus is hardcover and the dealer variant edition. Putting together International Sets, particularly of key issues (those US issues deemed economically valuable because of 1st appearances or deaths of major/minor characters), can be of interest to comic speculators who focus on economic investment and profit from the collecting and resale of comics. If a particular US issue #1 is valuable then what would be the value of an entire International Set of every single edition of that issue #1? Pricing for such an International Set would need to not only factor in the rarity, scarceness, and condition of the issues but also the time, work/effort, and costs of importing all of those issues (which in some cases may never be replicated). Such International Sets of particular comics could also be academically valuable for those working in translation studies. Building a unique collection of international comics with cultural, historical, and economic value is in stark contrast to the kinds of weekly comic consumption that occur across the USA and elsewhere at local comic shops. I have often wondered why collectors would engage in the replication of collections that exist to a much higher degree than their international counterparts? Of course, the love of comic storytelling and art plays a large part in that and rightly so! For myself and some colleagues, the time traveling thrill of the hunt in finding these editions and having them arrive at your doorstep from across the world plays a large part in the discovery and collecting of international comics. Wow, great article. Thanks for all the research and information. I love the time effort and energy you put into putting this post together. Intriguing and informitive as well as interesting visually to see all the different versions.